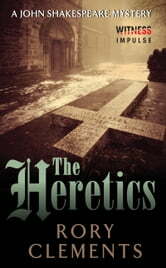 An exorcism … a siege … a stealthy killer … What else could go wrong? John Shakespeare—intrepid private detective and brother to a rising young playwright in Elizabethan London—is approached by a condemned Jesuit priest with an unusual proposition: the Father is haunted by the memory of Thomasyn Jade, a teenage girl subjected to brutal exorcism rites a decade past. He wants Shakespeare to track her down and offer reparations for her treatment. Heart-pounding and packed with fascinating historical detail, The Heretics is a thriller to rival the best of C. J. Sansom and Alex Grecian. Not the best in the series but worth the read. This is the fifth John Shakespeare mystery I have read and although it was not my favourite I did enjoy it. I found the plot somewhat convoluted and there were too many subplots which were loosely and unsatisfyingly tied together at the end. I enjoyed Mr.Clements previous books in this series very much. The dialogue and historical atmosphere ring true and the character development is excellent.